Hi All, finally gone the toylander route! I have been playing around with plastic jeeps and cars with my boy (4 1/2) and have finally gone to the toylander - the plastic ones were just not lasting long enough or fun enough. I brought what I thought was a complete toylander on ebay (as I dont have the time for a full build I thought a refurbishment would be the way forward) - unfortunately it has not been loved - it was a toylander willys jeep (jeepster) but has been butchered - now has what looks like a mobility scooter rear axle, larger wheels, front wheels slightly smaller than the rear, all trailer wheels, not orig toylander ones, missing the throttle. It does have some good bits, hubs on the rear with brakes on each (controlled by a decent brake pedal and cables), a working indicator stork, decent lights, decent batteries and its all running 24v with a step down for the 12v lighting, the steering wheel is all metal (looks like a large valve handle) and the windscreen isnt broken! Well thats my start - bit of an ebay mistake, now to try and bring it back to life without spending too much. Re: Hi All, finally gone the toylander route! Welcome to the forum, sounds like you have a bit of a project on your hands. Unless your description is on the harsh side it may take you just as long to put right this one as it would to build a fresh one. it sound like the original person was a bit of a bodger who liked doing thing on the cheap. Either way it sounds like it will be a nice little project. Thanks for the reply and welcome. Probably right but I am reluctant to let this one die - I have all the parts of a mobility scooter to make a new one, that will be my 2nd project (for the girl who is only 2) - this will be my training toylander, will have to be done cheeply as I save up for a proper one and this one has quite a few of the bits I wasnt so sure of already sorted (and having it in front of me is much easier for me to understand how some problems were resolved). This one will probably end up being a bit rough and ready so they can just play with it (and I can then sell the plastic ones), the next one will also cater for my needs! The Jeepstar just fits in my car so it a good starting point. 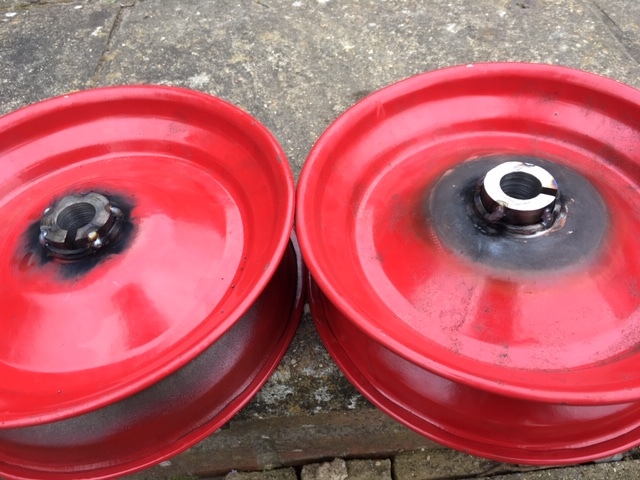 I have found some 1inch hubs for £32 on ebay which I hope will sort the front out, was thinking of getting a full new steering rack (to upgrade to the pivot and include the ackerman bit) and 4 wheels from Toylander but just dont have the cash at the moment - I'll make do and upgrade later (although I will be looking for some cheap 4 stud wheels so they match). I am finding it difficult to get a copy of the Jeepstar plans, they just dont seem to be available and are so old that people have lost them. May be worth moving this to another part of the forum! As I get into this, have taken out all the lights and as many ancillaries as possible and started sanding) it seems that the internals are good quality, proper speed controller, very nice rear axle with hall brushless motor combined (doesnt look like its from a mobility scooter) and all the electrics are good leds, relays etc (just very shoddy wiring). It does look like they took an origional toylander Geepstar, took all the kit out (lots of holes that show where it was) and put in some quality parts. Body although tatty seems solid but front steering needs work - the stubs wont take a 1 inch bearing for the new hubs that arrived today so I think they may have gone a bit oval over time. May not have been a bad ebay purchase after all. Anyone know which would be the best place to start a thread on my Geepstar refurb. Need some help and advice on mounting toylander wheels to a hub, and a hub to the steering stub? 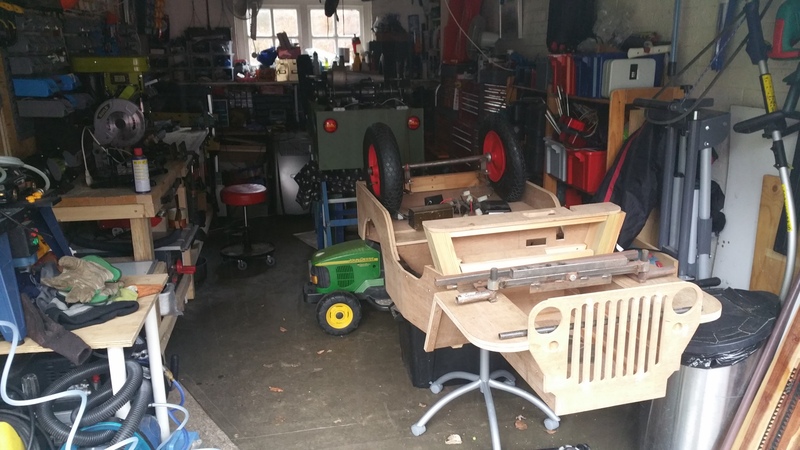 I am getting there, just building a steering box as its too heavy for my boy to steer - using an old ride on lawn mower bit so quite 'rustic'!! So this is the solution for fitting wheelbarrow wheels onto the mobility scooter axle - I found an engineer who would machine some plugs with a 19mm bore, a 5mm slot for the key and 35 mm diameter - unfortunately I gave him the measurements without any tolerances, so had to trim them a bit (cost £20 all in for both). I cut the excess off the middle to make it flush. Then I (my Dad) welded them into the hubs - a bit messy and the damage is from forcing them in and removing them before I trimmed - lesson learned! It will be covered up when I paint them. So all in all it cost £60 and some work for a full set of wheels. So you all know the plan - I have taken all the running gear and electrics out of the Geepstar, am replacing with the bits from a pride victory mobility scooter, leaving the older running gear etc for the newer MB43. 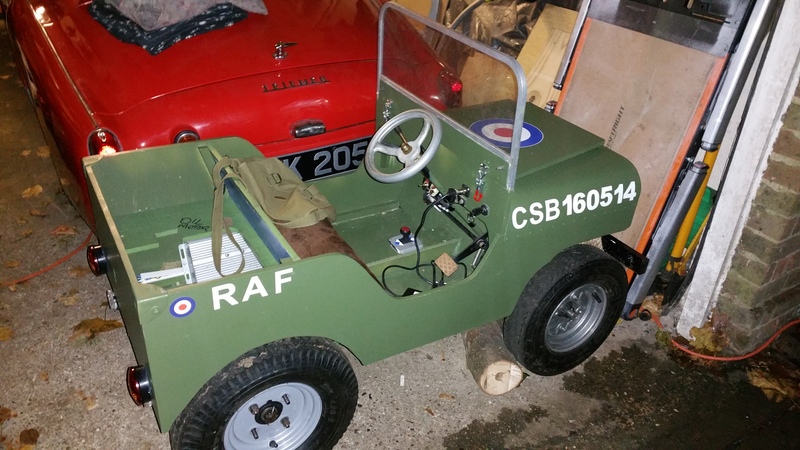 A bit of a pain but it fitted better that way as the mobility scooter wasn't wide enough to fit on the MB43 but fine for the Geepstar - plan is to have the Geepstar up and running for the summer, then work on the MB43 over summer and winter. Eventually the MB43 will then be for the boy as he grows (he's almost 5) and the Geepstar will then be modified (painted) for the little girl (who is 2 1/2).